Ensuring you undertake good tattoo aftercare is an extremely important task, especially straight after getting a new tattoo. One of the most important jobs to get right during your healing process is cleaning your tattoo correctly and effectively. 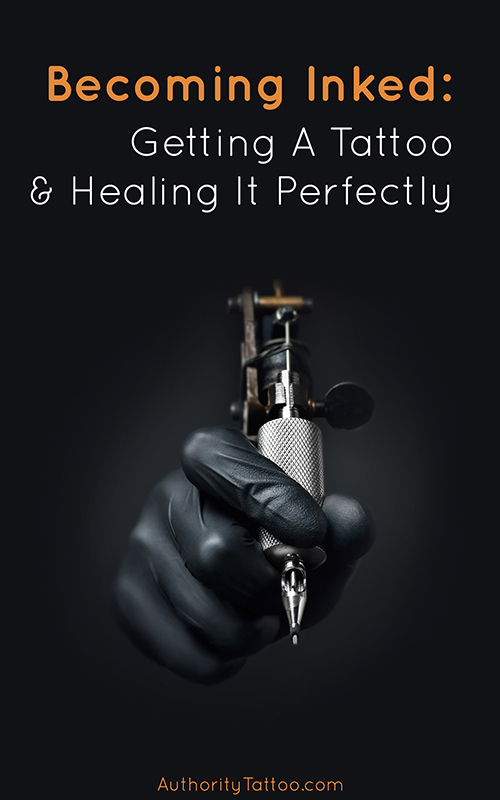 In this article we’ll show you how to clean a tattoo properly in order to prevent infection and promote quick healing. 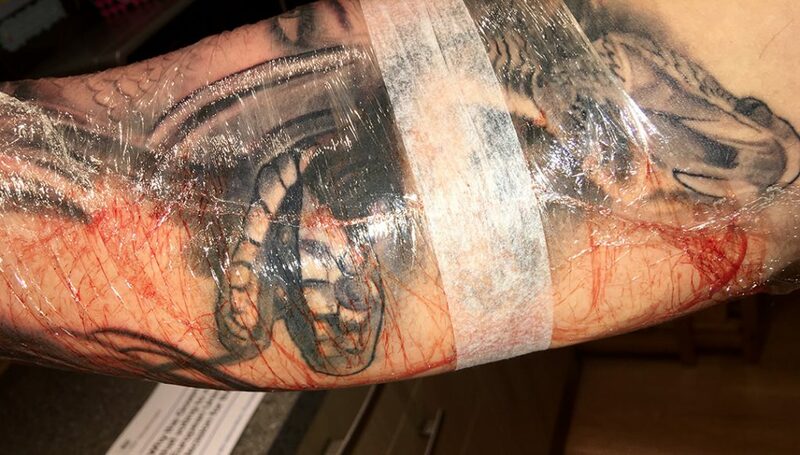 At the tattoo studio, after your artist has finished their work and you’re happy with it, they will proceed to wipe your tattoo down with antibacterial soap and wrap it up in either a plastic or a surgical wrap and will advise how long you should wear the wrap for before removing it. A good tattoo artist will also advise on the best way to clean your tattoo, and how often. Once you’re at the stage where you’re able to remove the wrap, now comes the big moment – the first clean. You must remember that as soon as you remove your wrap you will want to clean your new tattoo RIGHT AWAY. This is the first step into your tattoo aftercare routine. Cleaning a tattoo isn't exactly the most pleasant thing to do, but it is so important throughout the whole healing process. When the artist wrapped your tattoo the area had been sterilised and wrapped up bacteria-free. As soon as the wrap is removed, free-flowing air is restored to the area and bacteria will begin to be able to thrive around the open wound, so it’s important to get the area cleaned up again as quickly as possible. Not only this, but the whole time the area was wrapped, it will have been seeping with blood, excess ink and plasma. Don’t worry, this is completely normal so don’t be alarmed if you see some blood running underneath your tattoo wrap. All of this oozing needs to be cleaned up to prevent excess scabbing. The plasma (clear gloopy liquid) is a primary component in the scabbing process, and to prevent any thick, ugly scabs from forming, you will want to remove as much of this plasma as possible within the initial wash. Please note that your tattoo will definitely scab to some extent (it’s how all open-skin wounds naturally heal). As long as you can keep the area clear from oozing plasma for the first few days though, the scabbing should generally be very light and should only raise slightly over the skin. This first tattoo wash (and each wash over the next few weeks for that matter) is very important. If you are not careful, doing something wrong whilst cleaning the area can quite easily cause problems. Make sure you follow this article carefully to ensure that your cleaning your new tattoo as best as possible. As the tattoo healing process goes on, the daily process cleaning of your tattoo still needs to be strictly adhered to as your tattoo will continue to be vulnerable to infection for at least 3 - 4 weeks after initially stepping outside the studio with your new tattoo. Unquestionably the most important wash you’re ever likely to undertake in your tattooed life is your first wash after getting a new tattoo. As mentioned above, the tattooed area is essentially a raw open wound, extremely prone to bacterial infections and continuously oozing excess ink, blood and plasma. 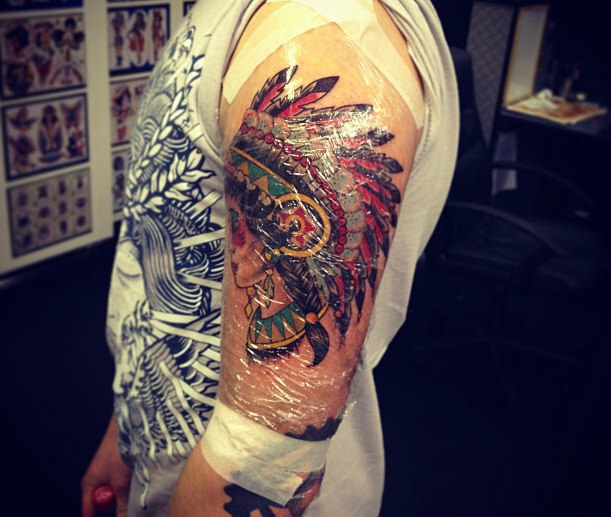 Although there are many different methods of cleaning a new tattoo, the below steps are proven to ensure the area is washed completely clean of any harmful bacteria and will ensure your tattoo heals as quickly and trouble-free as possible. Extremely important! What’s the point of worrying about getting your tattoo clean when all you’re going to do is make it even worse by rubbing your dirty hands all over the area without washing them? ALWAYS make sure you thoroughly clean your hands with a good antibacterial soap before so much as slightly touching your tattoo. You can use any strength hand soap you please as long as you thoroughly rinse the soap off with warm water before touching your tattoo. Some soaps can be very harsh on the extremely sensitive tattooed area. 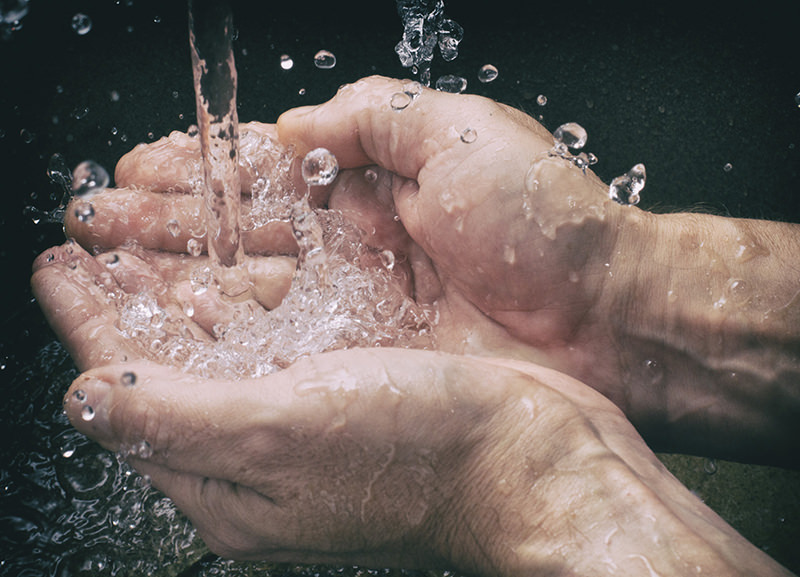 Once your hands are thoroughly clean, run a tap until the water turns lukewarm. You don’t want the water any warmer than this as the skin will be very sensitive and the warm water can be painful. Not only this but warmer water can open your pores, which in turn could potentially cause ink to be drawn from the skin. DO NOT stick the tattoo right under the tap. Cup the water with your hands and gently pour onto the tattooed area. Rub that water around the tattoo lightly with circular motions with your hand until the whole area in damp. DO NOT do this for too long as too much water can saturate the area and waterlog your pores, causing ink to rise and drain. The tattooed area is likely to be very sore at this point, and will properly sting slightly as you rub the area with water. This is normal and unfortunately you will have to push through the pain, just try to be gentle. The pain should subside over the next week. 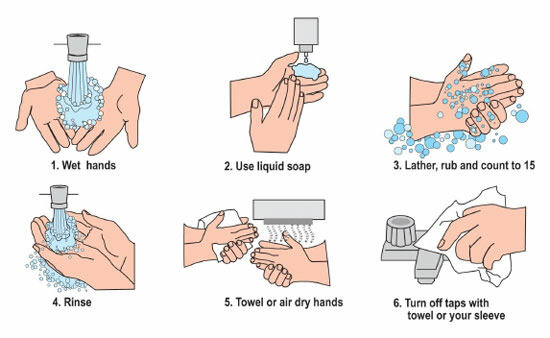 Once the area has been dampened, rub a mild, fragrance and alcohol free soap onto the area using your fingers/palm. DO NOT use a wash cloth or towel to scrub the area. These materials are far to sensitive for your skin at the moment and are probably crawling with germs and bacteria, only use your hands to clean and dry your tattoo for at least the first month. You will not want to rub the soap into the area too hard either, but you will want to ensure your tattoo no longer feels slimy or slippery (from excess plasma) once you’ve finished cleaning. If your tattoo feels clean after using the soap, then you’ve most-likely done enough. If any hardened and stuck pieces of ink/blood refuse to come away from the area with gentle rubbing, just leave them where they are and don’t force them off. They will fall off by themselves over the next few days, or when you next clean the area. Ensure you check the ingredients of the soap as any artificial additives such as unnatural fragrances are likely to irritate the area and can cause rashes and other side effects. Alcohol is also very harsh on your sensitive skin as it naturally dries the area out, which is not what you want at this stage of the healing process. 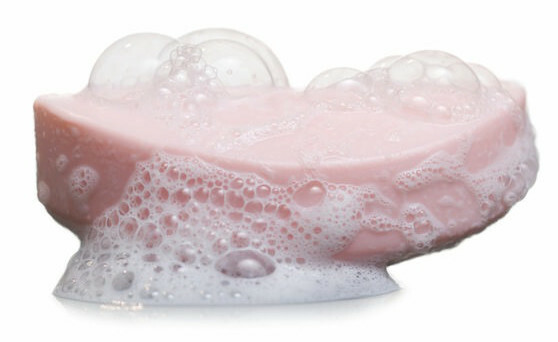 Make sure the soap is designed to be used on extra-sensitive skin. Once you have gently cleaned the area, cup some more lukewarm water and proceed to wash away any soap that still remains on the area – you don’t want any excess soap drying up over the area. If you notice any ink coming off of your tattooed area as you wash or dry it, don’t worry! This is completely normal and will likely continue to happen over the first several days of getting your new tattoo. 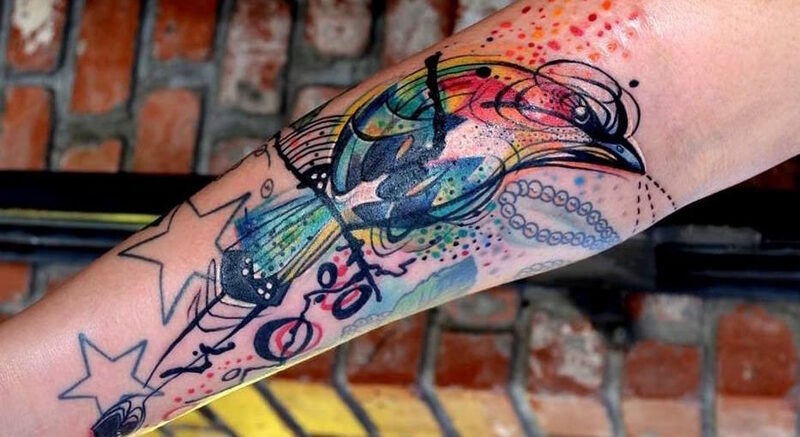 A good artist will try to cram the area with as much ink as they possibly can, and this will cause some ink to naturally get caught up in the higher layers of skin, and this excess ink will drain out over the coming week or so as the area continues to heal. Once the cleaning is complete, you will want to ensure that the area dries as well as possible. You can either gently press a paper towel onto the area, or just let the tattoo air-dry naturally. If you choose to use a paper towel, remember to gently dab the area and be careful when pulling the paper away from the area as it may stick slightly. For the first several days you may see patches of excess ink appear on the paper as you dry the area. As long as you’re being gentle, this is completely normal and won’t be causing any damage to your tattoo. DO NOT scrub the area dry. This can remove scabs and peeling skin, as well as potentially causing irritation to the area. Always gently blot the area instead of scrubbing/rubbing. Also, never use an abrasive cloth (or any type of cloth/towel for that matter). These products will likely contain many different types of harmful bacteria (even AFTER washing them), so stick to a new piece of paper towel when it comes to drying your tattoo. Once the tattoo is COMPLETELY dry, you will want to use a lotion/ointment of your choice in order to hydrate the area and aid with healing. When adding a lotion to the area, you will only require a very small amount – just enough to cover the area with a very fine layer, so the tattoo looks a little shiny. Too much lotion can prevent the area from getting enough air and breathing properly, potentially delaying healing times. 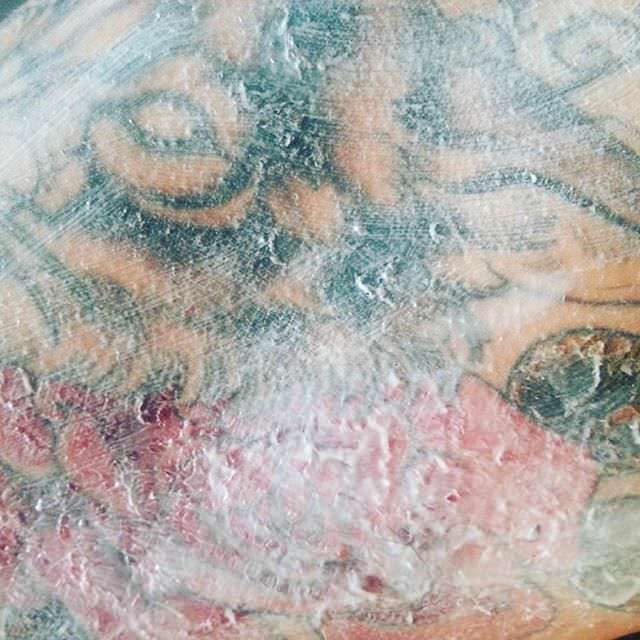 DO NOT add a layer of moisturizing lotion to the tattoo while the area is still damp, especially once your tattoo has reached the stage where it has begun to scab over. Any moisture trapped underneath the layer of lotion can get drawn into any scabbed areas and cause the scabs to swell and turn ‘gooey’ increasing the risk of the scabs sticking to various objects/surfaces and getting pulled off. As previously mentioned, you will need to clean your tattoo many more times after the initial wash. Ideally you should clean your tattoo around twice a day (morning and night is preferred) for up to a month after getting the tattoo. In some situations, you may want to wash your tattoo more frequently. For example, if you’ve been doing some work in the yard or been working out in the gym you should clean your tattoo as soon as possible as these places are naturally very dirty and normally contain lots of various germs and bacteria. Between one and two weeks after getting your tattoo, it will begin to scab and then peel. During these stages you will still need to clean the area just as regularly, but you will just have to be extra careful as to not accidentally rip of any scabs or pull off any pieces of peeling skin prematurely. During the latter peeling stages, you will probably notice that as you continue to wash and dry the tattoo like normal, lots of peeling pieces of skin will be falling off as you rub your hand/fingers over the area to clean it. As long as you’re being gentle, this is completely normal, it just means that the skin is ready to fall off. You should nice clear colors appearing from underneath the recently-peeled areas. Tattoos can peel lots while being washed. Don’t worry if the peeling skin contains any color/ink, this again is completely normal. 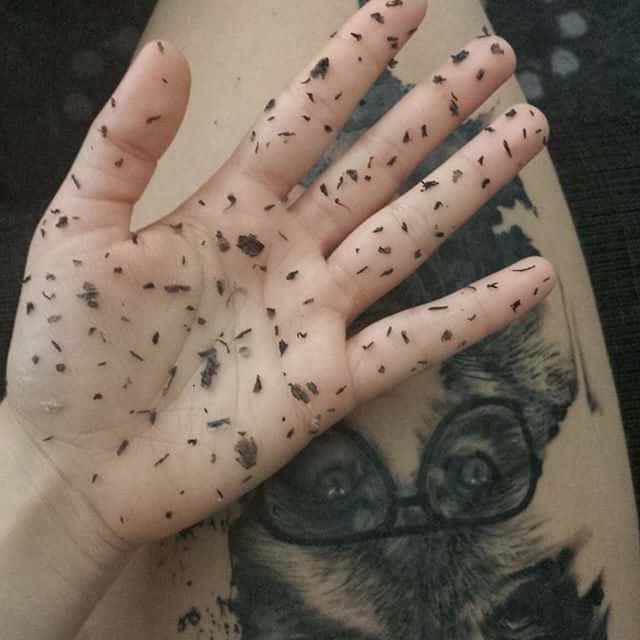 This is just more excess ink that had congregated in the upper layers of skin while your tattoo was being completed. I hope you can now see the importance of washing your tattoo properly, and now know how to clean your tattoo correctly in order to promote quick healing and lessen the risk of infection. The process of cleaning a tattoo isn’t time-consuming or difficult. It should only take 5 minutes every morning and evening for the first 3-4 weeks, so make sure you do it properly and consistently. The outcome should be that you have a beautiful, well-healed tattoo that you can show off for the rest of your life.